Experts discuss the U.S.-China nuclear calculus. 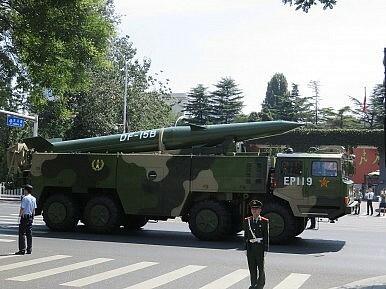 During a discussion at the Carnegie Endowment for International Peace on May 5, Tsinghua professor Li Bin characterized existing U.S.-China nuclear dialogues as “difficult and inefficient, in part because of differences in the ways that Americans and Chinese think about nuclear weapons.” To alleviate such misunderstandings and establish a common language for exchange, the five permanent members of the UN Security Council (P5) have undertaken a survey of relevant vocabulary to produce a nuclear glossary under China’s leadership. Although some see this effort as a distraction, U.S. Undersecretary of State for Arms Control and International Security Rose Gottemoeller and Li agree that it is a necessary step to deepen mutual understanding in a potentially dangerous area. You can find what appears to be the UN’s official Glossary of Key Nuclear Terms here. Published by the China Atomic Energy Press, the Glossary focuses on technical vocabulary concerning nuclear arms control and disarmament, testing and monitoring, material production, non-proliferation, energy, and safety and security. Deterrence vs. compellence: Deterrence means using nuclear weapons to maintain the status quo while compellence means using them to change it. Li noted that because large conflicts always spring out of smaller conflicts, it may not be practically possible to distinguish the difference, for example if one side launched a conventional attack and the other side used the nuclear threat to deter it. Arms race: Each side building its arsenal in response to the other, leading to a feedback loop that increases the rate of arms acquisition, casts a cloud over diplomatic relations, and threatens strategic stability. Li explains that China sees an arms race a competition to gain global hegemony, as when the United States and USSR built up their nuclear arsenals. Senior U.S. nuclear strategist Linton Brooks noted that, unlike during the Cold War, the United States is not seeking superiority over a specific opponent, but rather to prevent other actors from gaining hegemony themselves. Threats vs. security challenges: According to Li, the United States considers an actor to be a threat when it possesses both the capability and intent to harm the United States. China on the other hand views any potentially dangerous situation as a security challenge. This is not necessarily limited to foreign opponents but also includes issues like internal corruption and U.S. arms sales to Taiwan. Li points to the U.S. nuclear penetrator warhead is an example of the two countries’ divergence in perceptions: the United States believes it poses no a threat because it is a response to the North Korean threat and sized accordingly, posing no direct threat to China. China believes it lowers the bar for the use of nuclear weapons, thereby harming China’s security and constituting a security challenge. Thus, according to Li, China doesn’t consider intent at all. Another way of looking at this is that China assumes potential intent from capability. I agree with Li’s explanation and don’t believe China is simply using this to criticize U.S. actions. It would, however, be in everyone’s interest for China to be more cooperative on North Korea.